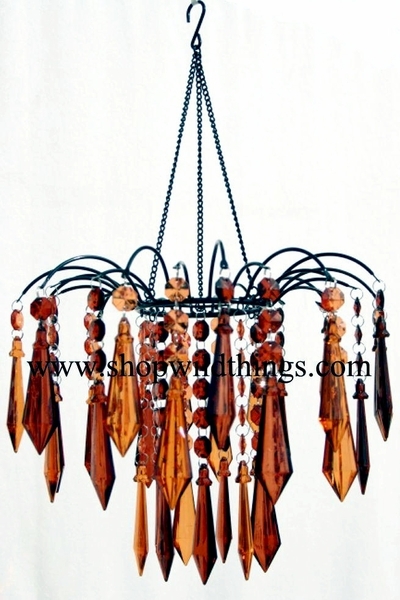 Wild Things is pleased to introduce this very classy, very hip, and very "Bejeweled" Amber/Brown two-tone chandelier! HUGE (4 inches!) 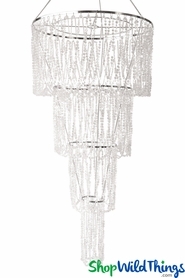 faceted crystals hang from octagon shaped charms. Made out of acrylic, looks like real glass or crystal!!! 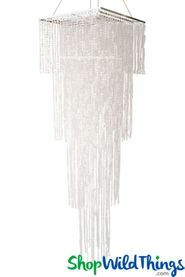 13" diameter, 10" in length from the "base"...hanging chain and hook is an additional 11" long. This is so fun, its small had to hang more chain to it so I could lower it. Its just to small to hang up so high. I put it in my bathroom for mood lighting hot bath and an amber Chandler does it get any better.. This is not bright ( think candlelight ) I bought the battery lights that sit on top. It might be brighter with the light bulb attachment I dont know? Didnt want that.